A whole year now since I posted anything on this blog! 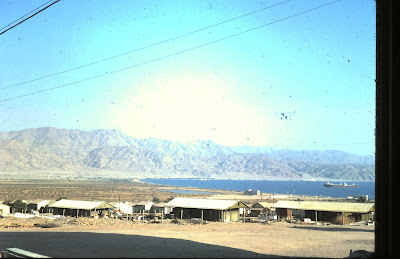 Photo taken from Eilat in Israel in 1963. 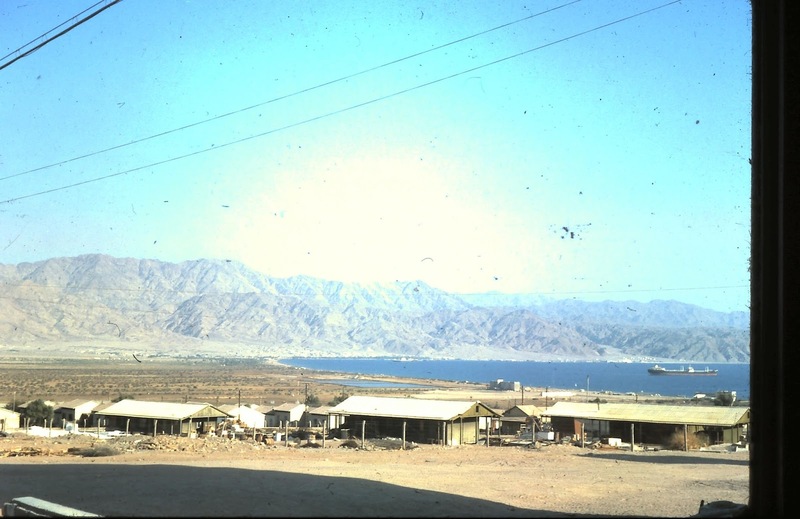 Aqaba in Jordan can be seen in the distance. I am currently reading The Seven Pillars of Wisdom by T.E. Lawrence in an attempt to view the background of the current hatred between East and West following the attacks on Paris lately. I borrowed the French version of the book written by Lawrence at the end of the First World War. It may sound odd but I am indeed finding the roots of the problem there. "Au cours de cette longue expédition, lui (Mohammed) et le chérif Nasir ne ménageraient pas leurs efforts pour améliorer mon arabe, me donnant tour à tour des leçons, l'un m'enseignant le parler coloré du désert, l'autre la langue classique de Médine. Parti d'une pratique hésitante des dialectes tribaux du moyen Euphrate (forme non impure), mon arabe était devenu difficilement localisable, un salmigondis, parlé sans peine, qui associait patois du Hedjaz et lyrisme des tribus du Nord, le tout émaillé de tournures littéraires syriennes et truffé d'expressions et vocables familiers empruntés au parler limpide du Nedjed. Cette aisance dans l'expression cachait une absence totale de grammaire qui faisait de mon propos une perpétuelle aventure pour ceux qui l'écoutaient. Les nouveaux venus me supposaient originaire de quelque région inconnue, dépotoir indifférencié des catégories grammaticales, des modes, temps, genres, nombres et cas de l'arabe." I don't know if what I am going to write here proceeds from any wisdom, we'll see. I will tell of my own experience in the Middle East in the years 1963-66 when I was 19 and 20, memories that forbid me to hate Arabs. Or Jews. I recall being welcome once under their tent in the hills of Galilee by a family of bedouins as if I had been sent by God himself. Sitting there with the smell of green coffee beans being roasted in a rusty frying pan over an open fire I enjoyed their hospitality with sheer wonder. In tiny cups I was offered this strong beverage with a taste of cardamon. Everyone laughed when having put my empty cup down the Arab hostess poured some more in it. I was explained in half arabic half hebrew that by putting your cup down you meant you wanted some more! To this day the smell or taste of cardamon recalls this happy moment in a bedouin's tent. My first experience of the desert was a trip on board a big and heavy lorry traveling from Beer-Sheva to Eilat across the Neguev through the night, a warm night full of bright stars in an atmosphere of invisible people. The desert is full of invisible people, friends or foes, you don't know! I lived and worked in a kibbutz, i.e. a collective farm, for a whole year. During the winter we worked under a shed sorting and packing flower bulbs. We were three at the job, an English guy, me and an Arab from the village across the road. The 'boss' was one of the kibbutz founders who had fled Austria in his teens during the second world war. We were all very good friends and worked well together. Six months later I became the girlfriend of my Arab colleague. When I left the kibbutz to go and work in Eilat, the then pioneer little town facing Aqaba on the Red Sea, my Arab friend took the risk to travel across the desert to come and see me. As an Arab he needed a pass to travel as far as Beer-Sheba. After that he traveled by bus at his own risk. He could speak both Hebrew and Arabic and did not look any different. He made it there and back. Although later, not being jewish or arabic, I chose to leave the country and marry an Australian citizen, I still keep a warm memory of the way his family had welcome me in his village. Now in 2015, half a century later, wisdom tells me at the back of my brain that these were beautiful people. We have walked a slow path of horrendous hatred, us in the West and them in the Middle East. Why? 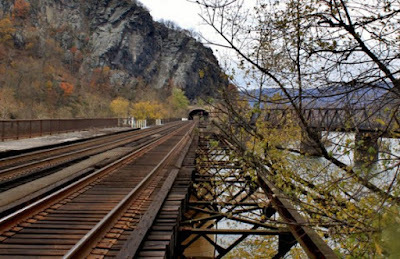 The reasons may be political or economical. But plain misunderstanding is more likely to be the cause. "Les Wahhabites, hérétiques musulmans fanatiques, avaient imposé leurs règles strictes à la paisible et civilisée al-Qasim. Dans cette ville, on ne pratiquait guère l'hospitalité du café, on priait et on jeûnait beaucoup; pas de tabac, pas de badinage avec les femmes, pas de vêtements de soie, d'ornements, de cordon d'or ou d'argent à son keffieh. Tout n'y était que piété ou puritanisme. Les hommes d'al-Qasim, des marchands qui alliaient goût de la vie et expérience du monde, trouvaient cela ennuyeux; leurs fils, moins patients, s'en allaient courir la fortune et les plaisirs."